Do you love to hike in the Smokies but hate to camp? Then I have the place for you — Mount LeConte Lodge, perched at 6,500 feet atop one of Tennessee’s most notable mountains. And the only way to get there is by foot. Unlike many of the grand national parks out west, such as Yellowstone or Yosemite, or even Shenandoah National Park in Virginia, Great Smoky Mountains National Park has no lodges or built-in accommodations accessible by automobile. LeConte Lodge came about almost by accident. 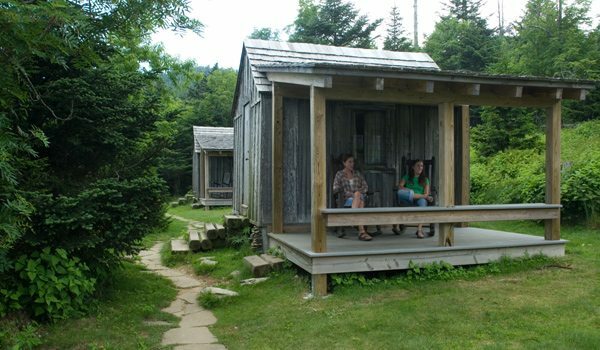 What is now the highest lodge east of the Mississippi River started out in 1925 as a collection of tents assembled by the Great Smoky Mountains Conservation Association, a group organized to promote the establishment of the Smokies as a national park. The folks in the association hosted prominent movers and shakers, showing them the wonders of Mount LeConte, including the famous views from Cliff Top at sunset and Myrtle Point at sunrise, attempting to sway them into establishing a national park here. From these humble beginnings, Mount LeConte Lodge was slowly transformed into an assemblage of cabins, dining facilities and main lodge building primarily by Jack Huff who operated the hostelry along with his wife from 1926 through 1959. Later, ownership of the lodge went through several hands, and is now operated through a lease with the National Park Service. You can’t mention Jack Huff without relating the famous story about taking his mother to the lodge. Back in 1928, Huff’s mother, after hearing about all these wonderful views from the top of Mount LeConte, wanted to see them for herself. Unfortunately, she couldn’t climb the mountain, so Jack attached leather straps to a wood and wicker chair, then literally carried her up the mountain on his back. Unfortunately for them the all-too-frequent fog and clouds encircled the mountain, preventing Jack’s mother from enjoying a view. Jack carried her back down three days later. Just as it was in Jack Huff’s day, you must hike to reach the top of Mount LeConte. The shortest distance is 5 miles one way. However, the effort required to reach the lodge only increases the rewards. Apparently hiking to the lodge doesn’t deter visitors from coming. In fact, on Oct. 1 of each year, would-be guests scramble to get on the Internet and book their chosen days. However, persistent hikers can call the LeConte Lodge office, located down in Gatlinburg and get available dates. Others get on a wait list. I was lucky enough to be invited by a multiple lodge visitor, Susan Range, at the last minute. I had never stayed at the lodge and was excited to experience this mountaintop retreat. We took the Bullhead Trail from just above Gatlinburg, hiking a well-graded path with plenty of views along the way. Down in the lowlands we could see old stone fences from Smoky Mountain pioneers, living at the base of LeConte. We climbed higher up the hardwood slopes, eventually entering the spruce-fir forest reminiscent of those in Maine or Minnesota. After eight miles of hiking, it was pleasing to see the collection of weathered gray buildings that comprise the lodge. The dark, main lodge building was lit by a kerosene lantern. Yes, there is no electricity up here. And that adds to the rustic charm. Authentic Mount LeConte and Smoky Mountain memorabilia decorated the walls. We checked in and then were led to one of the small cabins. They are cozy one-room affairs with small windows. The wooden buildings have a pair of upper and lower double bunk beds. The cabins are warmed with wall-mounted propane heaters, for which we would later be grateful. Covered porches with rocking chairs allow you to enjoy the outside. Restrooms are located a short walk from the cabins. Larger groups have a choice of three multi-room lodges that are available. Rain was falling by the time the dinner bell rang, and overnight guests scurried to the dining room. Mount LeConte has a capacity of 60 guests per night and they all dine together at once, family-style, at big tables, with plates and bowls of food being passed around, all in the dim but friendly glow of the lantern. Lodge personnel provide drinks and such. The food was hearty and we had our fill. Conversations can get interesting around the dining table, as you get to meet other guests. We sat with a group from North Carolina and a young couple from Nashville. Naturally, hiking and the great outdoors was the primary subject of conversation. The Carolinians chose Mount LeConte Lodge because of the challenging climb to the top. The young couple wanted to vacation with like-minded individuals — the walk to the top and the rustic conditions has a way of putting us outdoorsy types together. I for one was glad to be in the cabin that night rather than huddling beneath a tarp, as buckets of rain fell for hours. A front was moving through and temperatures were plummeting by breakfast, held at 8 a.m. Coffee and hot chocolate preceded the breakfast of ham, eggs, biscuits and pancakes aplenty. Hiking was on the agenda that day. Susan and I rambled out to Brushy Mountain, a shoulder of Mount LeConte that presented views of East Tennessee from Gatlinburg at the foot of LeConte to Douglas Lake in the distance and waves of mountains in the yon. Since we were staying two nights, we were provided a hearty sack lunch of chicken salad sandwiches, trail mix and a big ol’ homemade brownie. The temperatures kept falling through the day as the sky cleared and a front moved through. That evening we made the short walk to Cliff Top to soak in a famous sunset. The wind howled, pushing cold air right through our jackets, but the view was worth it, as Sol descended into a line of ridges to the west. We then scrambled to the dining hall and enjoyed another meal. Susan and I supped with a whole new set of guests, as most of them stay for just one night. We were amazed with our companions — at our table were guests who came all the way from New Mexico and Minnesota, just to enjoy this Tennessee treasure. The stars lit the way on the walk from the dining hall to our cabin. Our footsteps crackled over the frozen ground. On that winter night the low went to 8 degrees. Next morning, after another robust breakfast, we rambled back down the mountain. Crisp air hastened our pace, but we stopped to soak in vistas of East Tennessee, brought into focus by the cold front. By noon we were back at the parking lot, our mountaintop experience finished.